Use the form below to sign up for yourDestination Points Business Center Card. Paid members enjoy access to the "Destination Points" Business Center, located on Concourse B. Once inside, enjoy free coffee, cappuccino, and bottled water. Please allow up to two weeks to receive your card via US mail. One per household please. 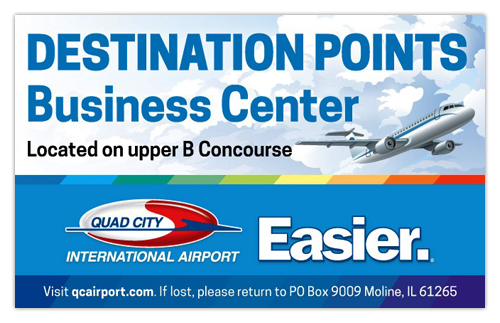 By completing the application form, you will also be subscribing to Quad City International Airport's periodic E-Alert newsletter. You may opt out at any time. Approximately how many times do you fly out of the Quad City International Airport in a year? Carrier you fly with the most? Which carrier do you fly the most with in a given year? If it varies, then choose "Varies"